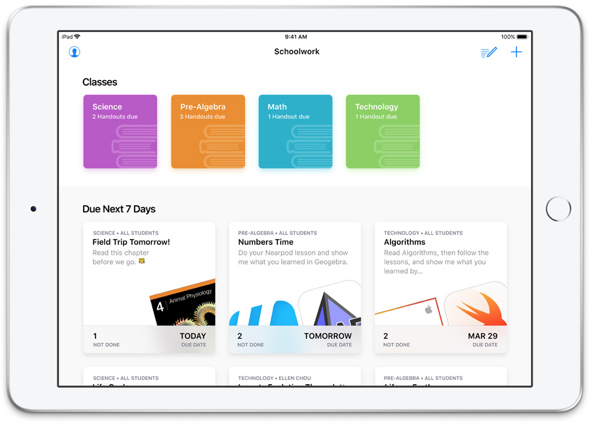 Apple’s all-new Schoolwork app lets teachers easily assign anything from worksheets to activities in educational apps, follow students’ progress, and collaborate with them in real time. MacDailyNews Take: Standby for Apple’s “HR” app for iOS and macOS! Why not? IBM could also use the platform to develop and market business solutions on their and Apple’s behalf. Apple has a long track record of launching stuff related to education then forgetting about it. Later they euthanize it. If you want orphaned software, buy Apple. Ask users of Aperture, Final Cut Pro, etc. The school system that I am contracted to in a specialized teaching position just bought 9000 computers last year, mix of Dell laptops which are much better than they use to be, and Chromebooks which do well for what they are used for. Even then, management of the new IT environment is different than it was two years ago, so the likelihood of ANOTHER big change is unlikely for at least 3 years due to the cost of changing even though its still Windows and Google. I own one of the 8 year old MacBooks that I bought surplus from the school, have run it for 5 years, but I need also to run Windows (Sharepoint) for student documentation. So to think that somehow there is going to be this magic moment that takes us back to Apple is just a dream world. The students who do high end work in graphics, etc use their own Powerbooks etc for that, self-taught at home in the apps of their choice, and in their own specialized areas are more qualified than the computer teachers who only have time to teach basic office apps. That world works pretty well, all things considered, so as a taxpayer I am not going to lead some kind of charge for revolution. I do my HTML5 animations and web development on my own iMac 27 inch, would not, could not change to Windows for that and just don’t see the point in starting war that I would just burn up all my energy and time. While not a bad idea to use the App for businesses, it would have to compete with more established products like Microsoft’s Sharepoint. A difficult task even if Apple also considers opening access to the lessons to other client platforms.